Situated on the western banks of the Tamar River at Beauty Point, Platypus House offers the rare opportunity to see the unique Tasmanian platypus and echidna in an indoor setting. 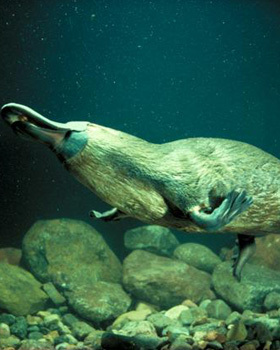 Thousands of years of isolation now suggest that the Tasmanian platypus is becoming genetically discreet from their mainland neighbours. Here you will learn and discover the true beauty of these mammals. Each tour explores and views the platypus ponds where you can watch them feed and play and a walk through the echidna garden. Entrance also includes viewing the Interpretation Centre and a 15-minute film in the Theatrette. Don't miss out on a guaranteed sighting! The Platypus House is conveniently located along the coastline overlooking the Tamar River, less than an hour from Launceston. Make sure you visit the Platypus House Café and souvenir shop afterwards to pick up something special.